We just moved. The last time we moved we had one 18-month old child. This time we have two children and we homeschool! Even though our new home is only 20 miles away (our last move was over 1500 miles), it was significantly more work moving all our school books and learning supplies. Honestly, who knew we had so many books and board games! Or bookcases! I never realized we have 12 of them! Thankfully, our move took place during our long winter break from school, so I haven’t been trying to juggle lessons along with all the rest. But in the mean time, I have two young children who are getting bored without access to their usual amusements. It’s the dead of winter in Missouri and they can’t simply run outside all day. Thankfully, all it takes is a willing spirit and a little imagination to have some fun! 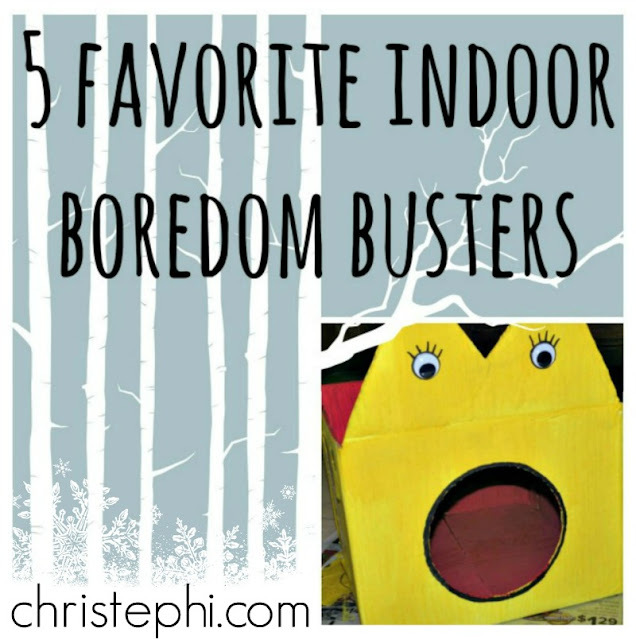 Here are five of my kids favorite boredom busting ideas for when they’re stuck indoors. If you’ve just moved like us, one thing you have plenty of is BOXES. Turn a box into a fun game with a little imagination. Cut a mouth and shape the top flaps into ears or horns or hair. We decorated ours with poster paints and a sharpie, but you could use acrylics, spray paint, markers, or construction paper to give your box a little personality. Then feed that monster! What’s that? You’ve made a lovable monster box and have nothing to feed it? Never fear, beanbags are fun and simple to make! You can use nearly anything to make them too. All you need is a needle, thread, some cloth, and something to stuff them with. We’ve used everything from washcloths to holey old jeans to sheets of felt to make beanbags with. And we’ve filled them with unpopped popcorn, dried beans, cotton balls, and even small wads of newspaper. It’s a simple craft that keeps little hands busy and yields a fun and versatile toy in a relatively short period of time! Once you have a few beanbags, the games are endless! Play hot potato, put one on your head and practice walking like royalty, start up a game of hackey sack. Since we live in the city now, the kids spend hours just looking out the windows, watching the doings in our new neighborhood. They’ve developed a game where each kid picks a window and watches cars go by. They “collect” cars by counting them, but every time a service vehicle with ladders goes by all their collected cars “escape” (up the ladder, I assume), and they have to start over. Whoever has the most cars after an appointed amount of time is the winner. This game is fun because it can be adapted to be more or less competitive according to your family’s preference. Sometimes when the natives get restless all you want to do is tie them up and throw them in a closet so you can have a little peace and quiet for a while. Well, next time go for it! Only make it a game and not an act of aggression. My kids have had a blast taping up each others’ wrists with a spare roll of masking tape and then “busting out” of their bonds. Over and over. Good, cheap entertainment, I call it! Oh, and as a bonus, they gathered up all their used bits of tape and made a huge masking tape ball that has served to keep them busy for hours more. They keep adding to it and are having a grand old time. Sometimes it’s the simple things, right? 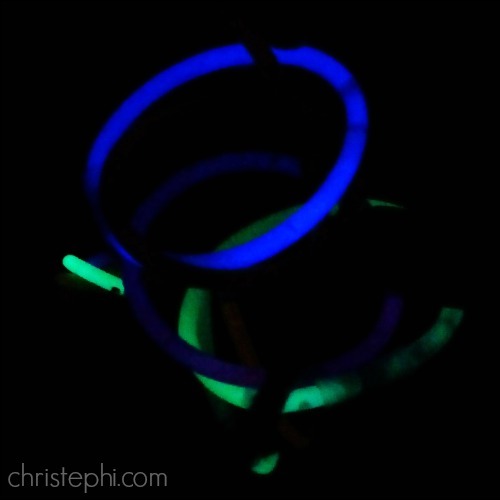 I hope you are having a wonderful winter and are not burning up with cabin fever just yet, but if you are, give some of these simple activities a try. You might just hit on a winner in your family! This article was originally published in January 2015 by Home & School Mosaics.